You need to be a member of the Enterprise Admins group to complete these tasks. 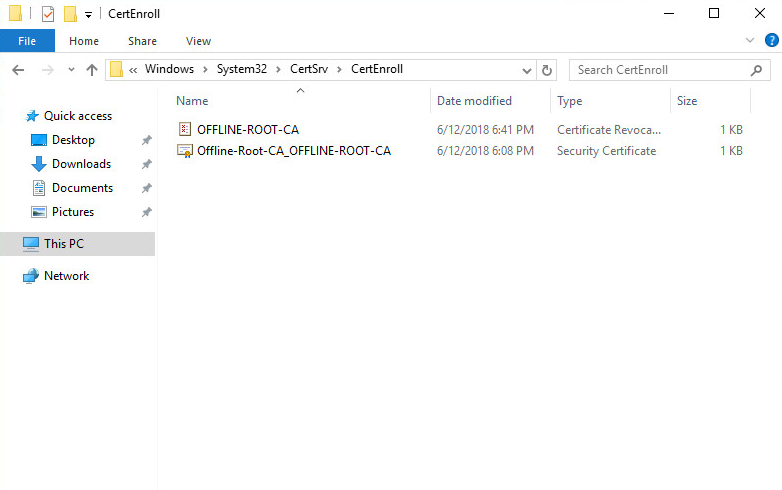 Just as with the offline Root CA, deploying Certificate Services on Windows Server 2012 R2 is simple, I stuck with PowerShell, view source blog for step-by-step GUI tutorial. Instal-ADCSCertificateAuthority? In the source guide he talk about creating a CNAME record, since he set his offline Root CA CRL to point to “clr.blah.domain” in my case I specified the direct hostname of the CA. Maybe he did this for obfuscation security reasons, I’m not sure, either way I skipped this since an A host record already exists for the path I entered in the CRL information for the offline root ca. 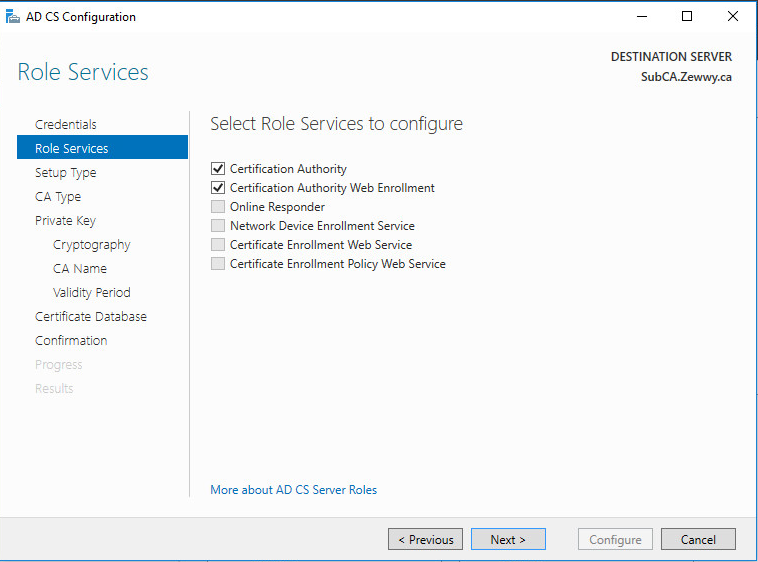 After the Certificate Services roles are installed, start the configuration wizard from Server Manager – click the flag and yellow icon and click the Configure Active Directory Certificate Services… link. My CA server is core thus no GUI, thus no direct Server Manager. Connect to a client system that has required network access to run Server Manager and point it to the CA server. In this case I’ll be using a Windows 10 client machine. 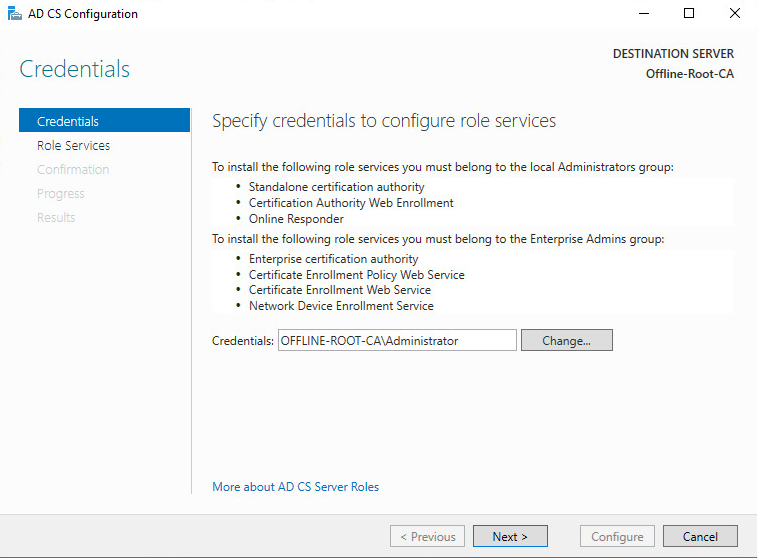 Run Server Manager, and add CA server as Domain/Enterprise Admin account. Then just like the source blog guide, you should notice a notification at the top right requiring post ADCS configuration deployment. Click Next, then select CA and CA Web Enrollment. 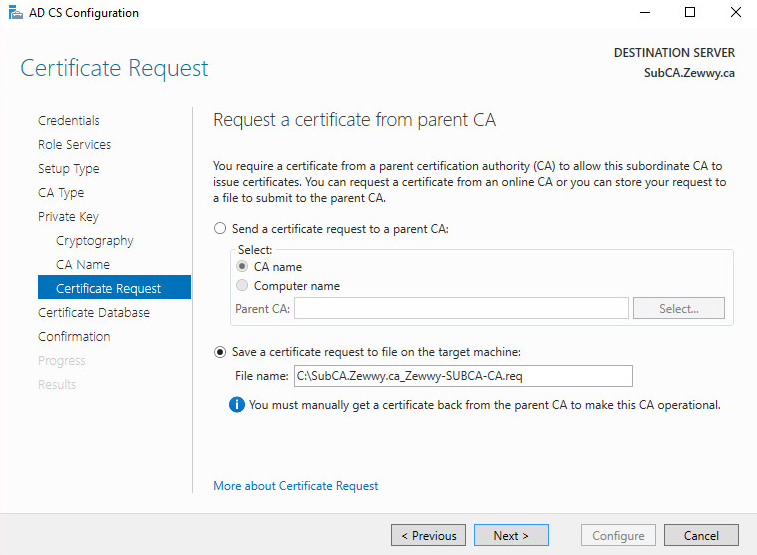 Click Next, Configure this subordinate certificate authority as an Enterprise CA. The server is a member of a domain and an Enterprise CA allows more flexibility in certificate management, including supporting certificate auto enrollment with domain authentication. 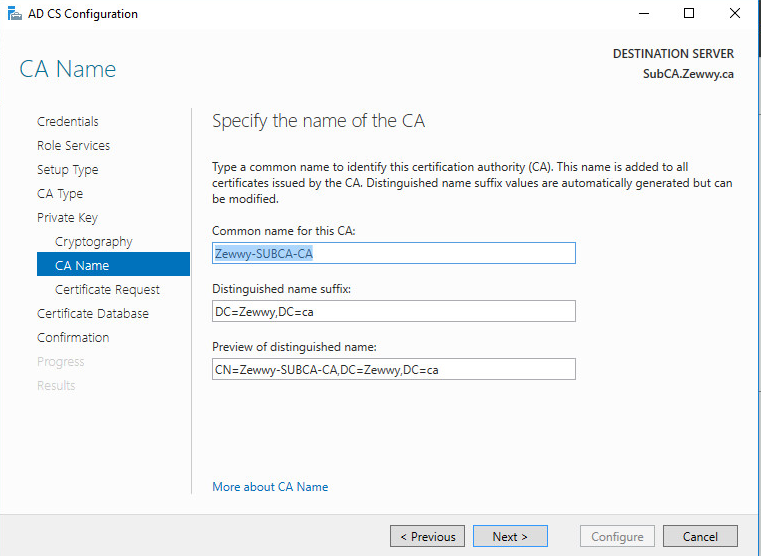 Click Next, Configure this CA as a subordinate CA. 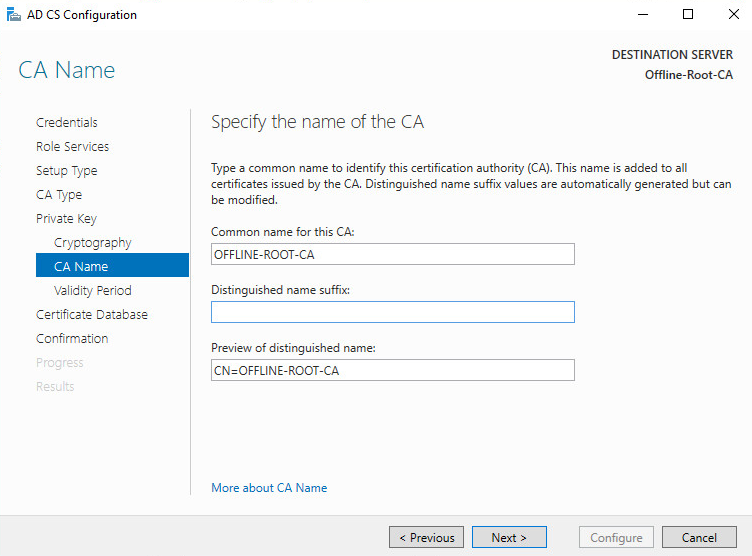 After configuration, we will submit a CA certificate request to the offline root CA. 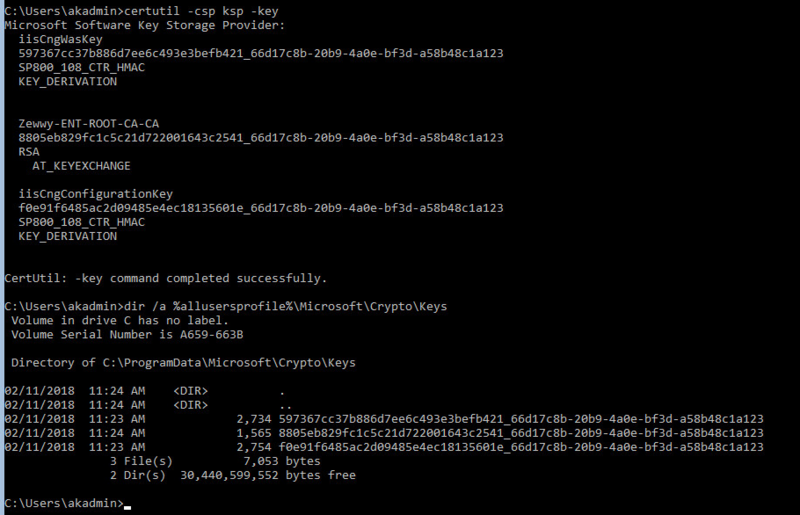 Click Next, Create a new private key for this CA as this is the first time we’re configuring it. Now I’m curious to see what CertUtil reports after this wizard and what the RSA directories on the CA will contain. They should contain the keys, right?! 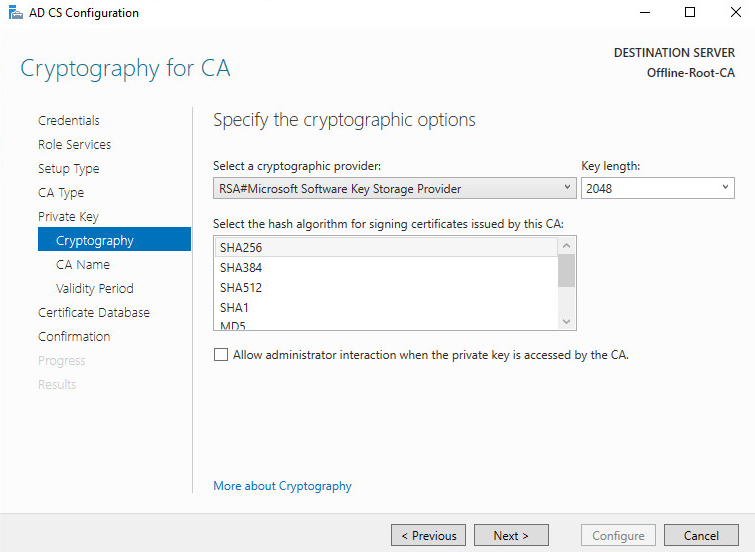 Click Next, leave the defaults, again simply going to use RSA @ 2048 Key Length, with a SHA256 hash checksum. Should remain the standard for hopefully the next 10 years. Moving along, click next, and specify the DB location. Generally leave the defaults. 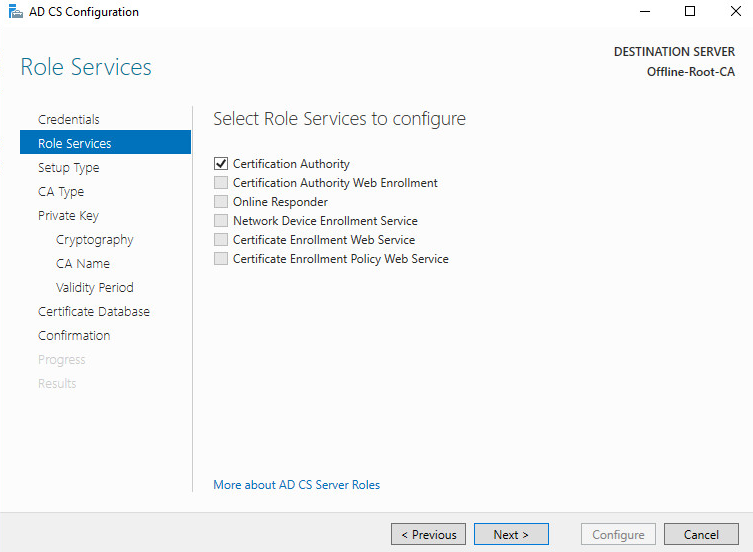 Click Configure and the wizard will configure the certificate services roles. Note the warning that the configuration for this CA is not complete, as we still need to request, approve and import the CA certificate. 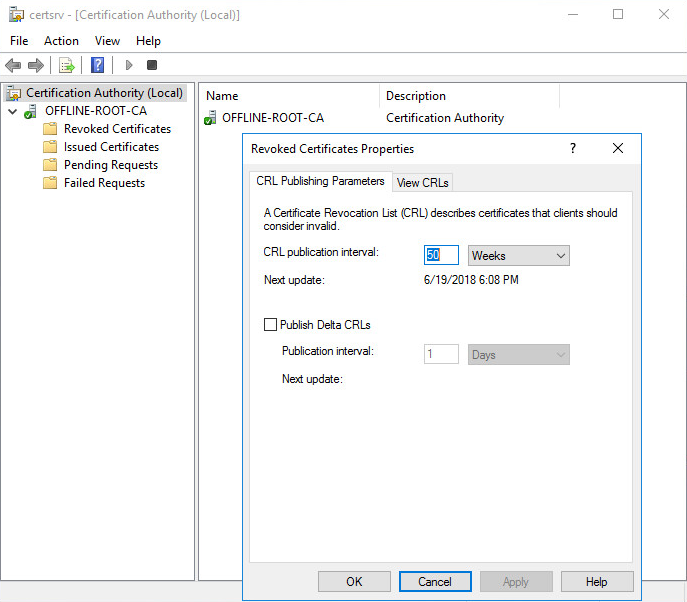 Before configuring the Certification Authority itself, we’ll first copy across the certificate and CRL from the root CA. 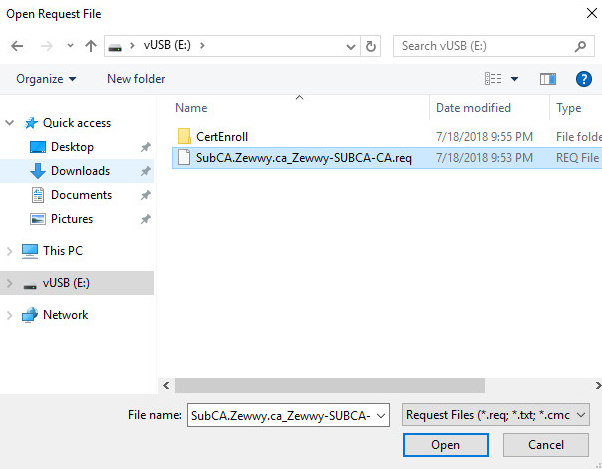 Ensure the root CA virtual machine is running and copy the contents of C:\Windows\System32\certsrv\CertEnroll from the root CA to the same folder on the subordinate CA. This is the default location to which certificates and CRLs are published. Keeping the default locations will require the minimum amount of configuration for the CRL and AIA distribution points. In my case it’s an offline (non domain joined) making a shareable UNC path is slightly painful in these cases, and for the most part, it is completely offline, and no NIC settings are even defined on the VM, heck I could remove the vNic completely :D. Anyway to complete this task I did the usual vUSB (a VMDK I mount to different VMs as needed to transfer files) and copied the resulting files specified above into this VMDK, then attached to the Sub CA VM, and moved files to their appropriate path. Again in this case the Sub CA is Core, so either use diskpart, or Server Manager from the client machine to bring the disk online and mount it. Next, we will request, approve the certificate request for the subordinate CA. 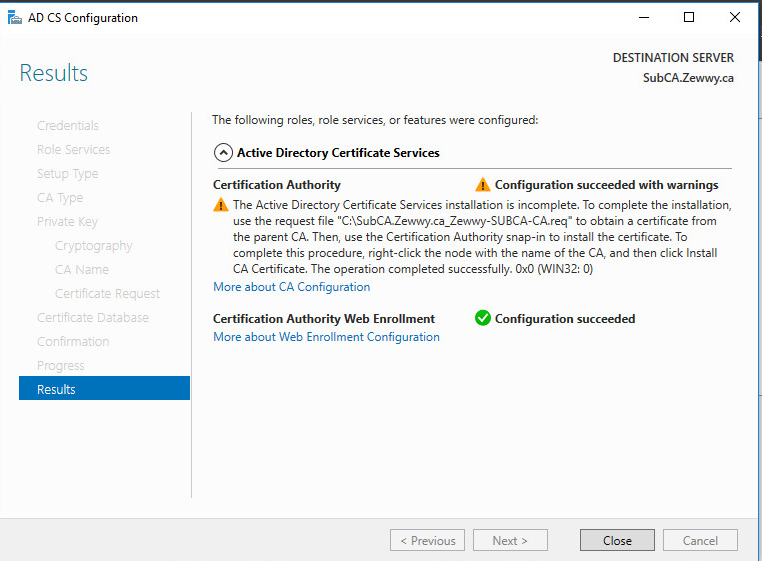 At this point, the subordinate CA is un-configured because it does not yet have a valid CA certificate. Copy the initial request created by the confiz wizard to the movable VMDK. 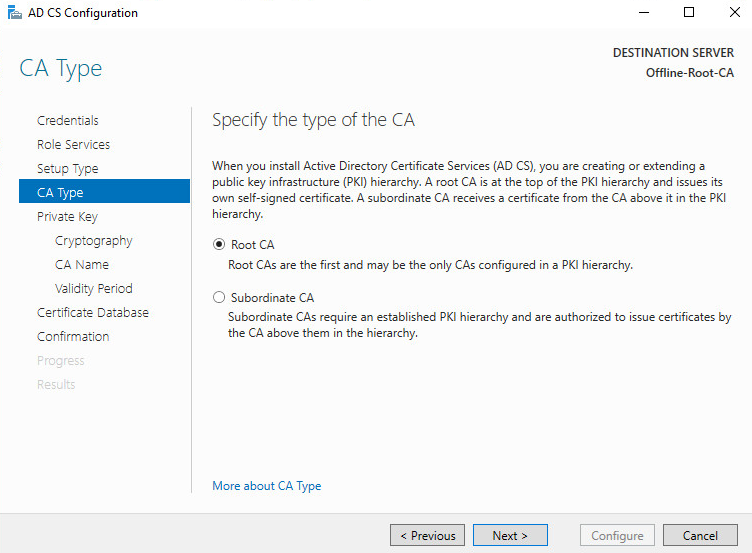 Now, remove the disk from the Sub CA and attach it to the Off-line root CA, then open up the CA tool to request a new certificate. (Don’t worry about taking the disk offline, it’ll unmount automagically). Browse to where the certificate request for the subordinate certificate authority is located and open the file. The certificate request will then be listed under Pending Requests on the root CA. Right-click the request, choose All Tasks and Issue. The subordinate CA’s certificate will now be issued and we can copy it to that CA. View the certificate under Issued Certificates. Right-click the certificate, click Open and choose Copy to File… from the Details tab on the certificate properties. 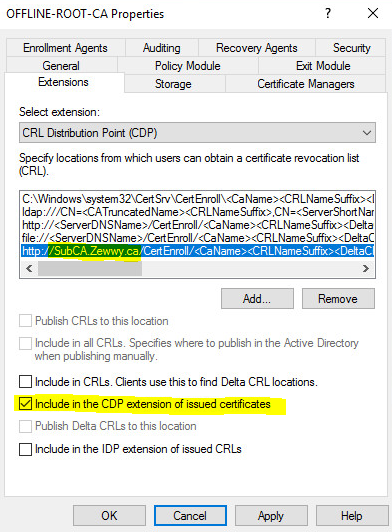 Export the new certificate to a file in PKCS format. Copy the file back to the subordinate certificate authority, so that it can be imported and enable certificate services on that machine. So I posted the bug on Technet, and Mark saved my bacon! WOOOOOO! We have a working Enterprise Sub-CA… Now the question on if CRL works, and how to deploy the chain properly to servers and clients so things come up with a trusted chain and a green check mark! “If the CRL is online correctly, the service should start without issues. Continuing on from my source blog post. In this case he goes on to install and configure the role to be a subordinate enterprise CA. But what do you do if you already deployed an Enterprise Root CA? I’m going to go off a hunch and that something gets applied into AD somewhere to present this information to domain clients. I found this nice article from MS directly on the directions to take, it stated for Server 2012, so I hope the procedure on this hasn’t changed much in 2016. *NOTE* All steps that state need to be done to AD objects, those commands are run as a Domain Admin, or Enterprise Admin directly logged onto those servers. 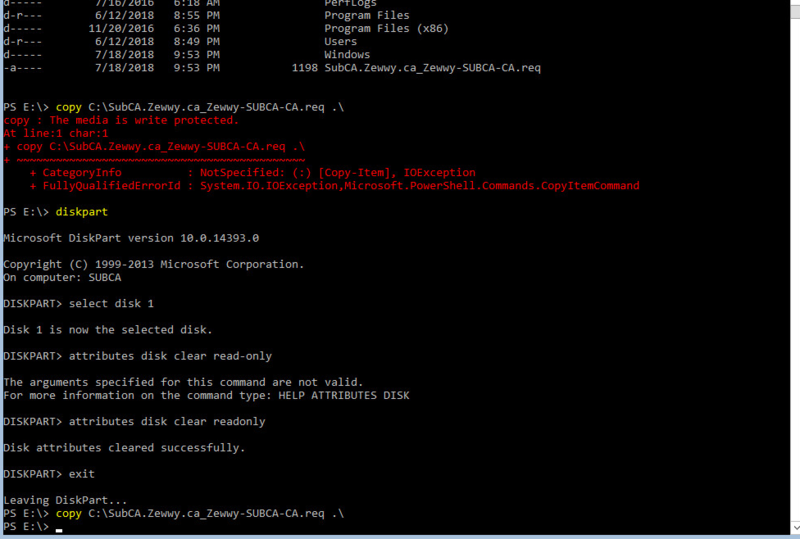 Most other commands or steps will be done via a client system MMC Snap-in, or logged directly into the CA server. Administrative Tools, and then click Certification Authority. Easy enough, done and done. New CRL, and then click OK.
Not the case for me. 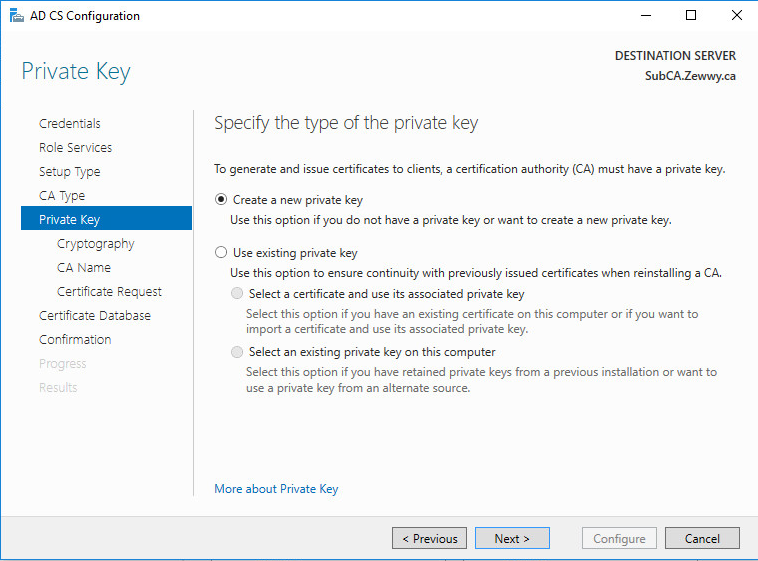 To stop Certificate Services, click Start, click Run, type cmd, and then click OK. Note If your CA name contains spaces, enclose the name in quotation marks. CertUtil: -key command completed successfully. And any attempt to delete the key based on the known CA name just failed. I asked about this in TechNet under the security section, and was told basically what I figured and that the key either didn’t exist or was corrupted. So basically continue on with the steps. It was later answered by Mark Cooper. Checking the keys directory show empty. Good stuff. 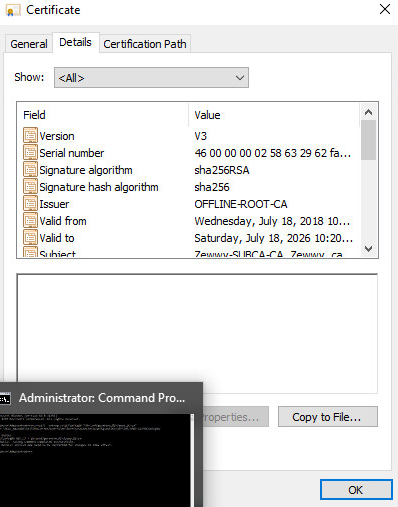 You can see they key container name matches the certificate hash. Nothing more than just a string of obfuscated code (much like opening up a CSR), so the only way to interact with them is using the Microsoft CryptoAPI (CertUtil), or the Snap-in. Reopening regedit, and the cert is gone. List the key stores again to verify that the private key for your CA was deleted. After you delete the private key for your CA, uninstall Certificate Services. To do this, follow these steps, depending on the version of Windows Server that you are running. By default, this information is kept on the server in case you are uninstalling and then reinstalling the CA. 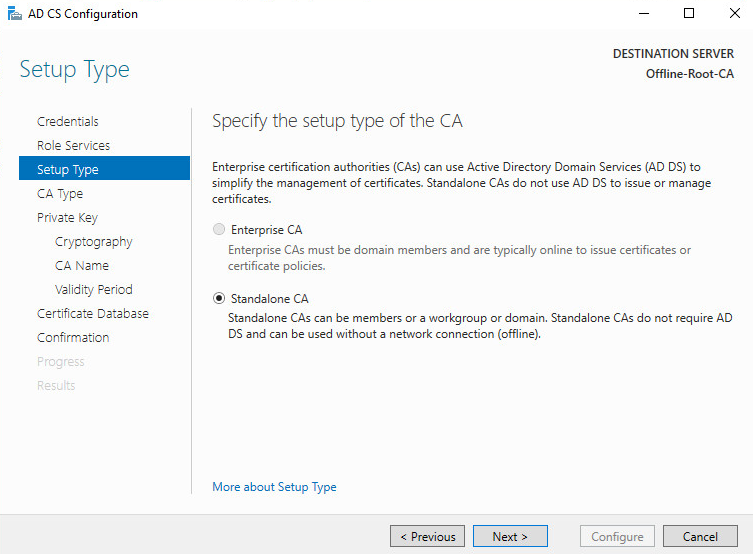 For example, you might uninstall and reinstall the CA if you want to change a stand-alone CA to an enterprise CA. 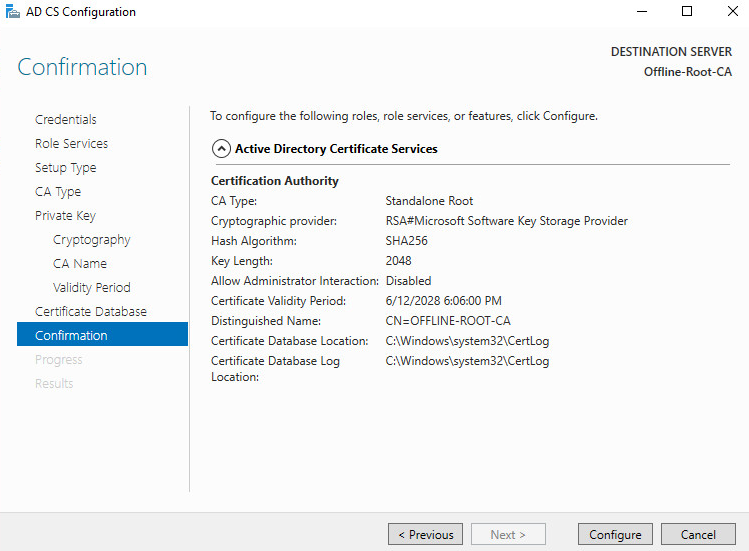 When Microsoft Certificate Services is installed on a server that is a member of a domain, several objects are created in the configuration container in Active Directory. When the CA is uninstalled, only the pKIEnrollmentService object is removed. This prevents clients from trying to enroll against the decommissioned CA. The other objects are retained because certificates that are issued by the CA are probably still outstanding. 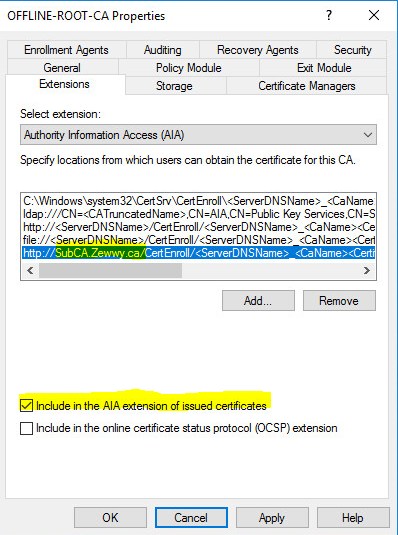 These certificates must be revoked by following the procedure in the “Step 1: Revoke all active certificates that are issued by the enterprise CA” section. Use Sites and Service MMC Snap-in from a client computer using a domain admin account with proper permissions, highlight the parent snap-in node -> View (from the toolbar) -> Show Services Node. 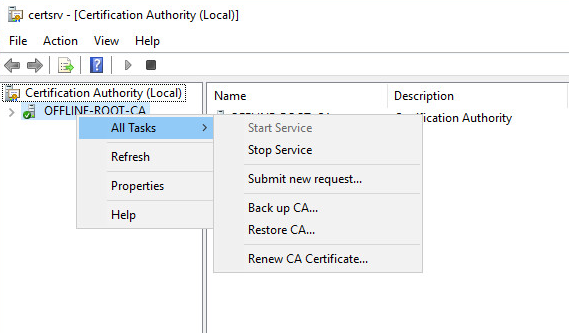 In the right pane, right-click the CertificationAuthority object for your CA, click Delete, and then click “Yes”. Left Nav, Click CDP folder. Left Nav, Click Certificate Authority. Open the remainingCAobjects.ldf file in Notepad. Replace the term “changetype: add” with “changetype: delete.” Then, verify whether the Active Directory objects that you will delete are legitimate. At this point I was having issues with the input command of the ldf file was failing. I posted these results in my Technet post. After a bit more research I noticed other examples online not having any other information appended after the “changetype: delete” line. So I simply followed along and did the same deleting all the lines after that one, leaving the base DN object in place and sure enough it finally succeeded. Second run I simply deleted the object under the KRA folder, and it returns no values. 13) Delete the certificate templates if you are sure that all of the certificate authorities have been deleted. Repeat step 12 to determine whether any AD objects remain. I did this via the Site and Service Snap-in, under the PKI section of the Services node. Nice and easy, I like these steps. Finally!!! What a gong show it is to remove an existing CA from an environment… even one that literally wasn’t used for anything outside its initial deployment as an enterprise root CA. Nothing special here, run through the windows installer as usual. Server 2016, US English, Next, Install Now, Server 2016 Datacenter (Desktop Experience), Accept EULA, custom, select blank disk, next. Install Complete, Reboot. Install VMware tools. 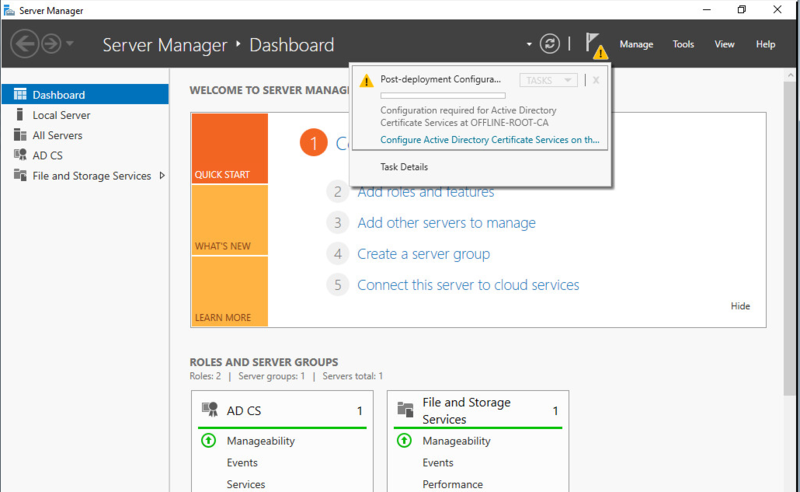 Deploying Certificate Services on Windows Server 2016 is simple enough – open Server Manager, open the Add Roles and Features wizard and choose Active Directory Certificate Services under Server Roles. Ensure you choose only the Certificate Authority role for the Root CA. 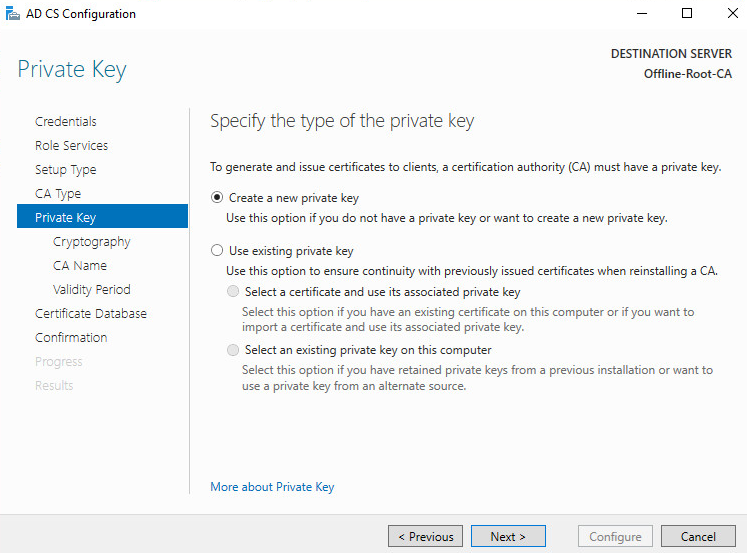 Set the credentials to be used while configuring Certificate Services. In this case, we’re configuring CA on a standalone machine and I’m logged on with the local Administrator account. For the Root CA, we have only on role to configure. 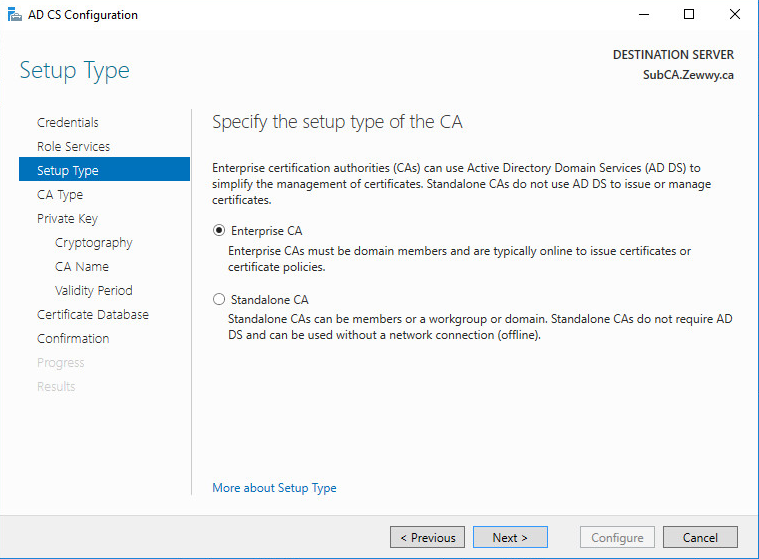 This certificate authority is being configured on a stand-alone server not a member of Active Directory, so we’ll only be able to configure a Standalone CA. This is the first CA in our environment, so be sure to configure this as a root CA. With the first CA in the environment, we’ll won’t have an existing private key, so must choose to create a new one. *Note there are many cryptographic providers available, but generally most places should stick with RSA, I have seen certain cases where DSA has been selected, only choose this option if you have a specific reason for it. As well generally stick with a 2048 Key Length, you can go higher if you know your system resources can handle the additional computational load, or lower if you are running older hardware and don’t require has high of a security posture. Specify a name for the new certificate authority. I’d recommend keeping this simple using the ANSI character set, using a meaningful name. Select the validity period – perhaps the default is the best to choose; however, this can be customized based on your requirements. This is a topic that is a whole security conversation in itself; however, renewing CA certificates isn’t something that you want to be doing too often. Considerations for setting the validity period should include business risk, the size and complexity of the environment you are installing the PKI into, and how mature the IT organization is. *Note pretty well stated, and in our case I don’t want to renew certs every 5 years, so 10 years sounds about good to me, and I’m hoping 2048 Key length with a SHA256 Hash will still be pretty common 10 years from now, but at least this gives us a very nice time buffer should things change. 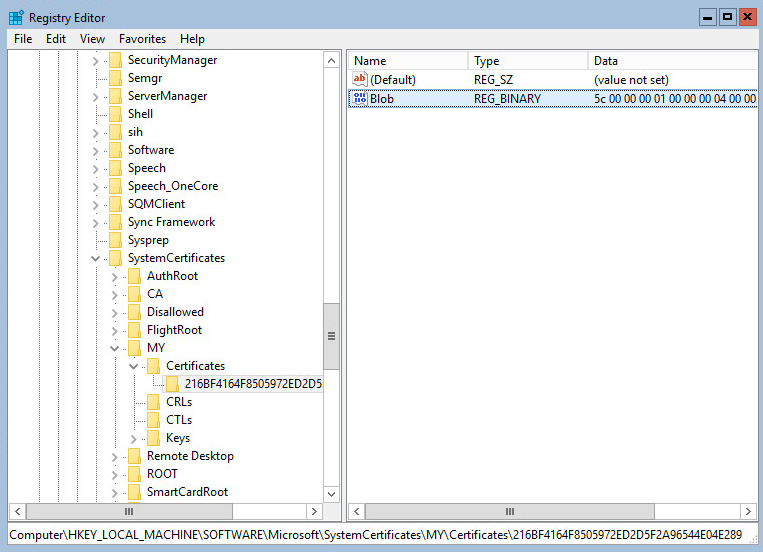 On the next page of the wizard, you can choose the location of the certificate services database and logs location (C:\Windows\System32\Certlog), which can be changed depending on your specific environment. 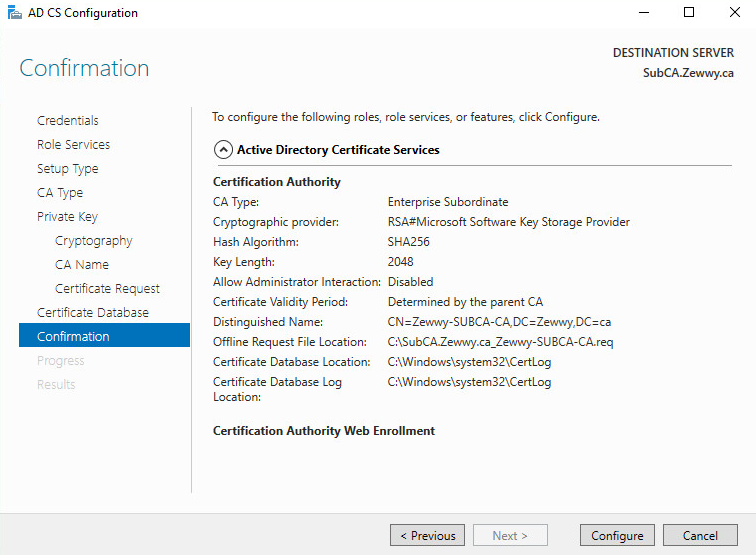 On the last page, you will see a summary of the configuration before committing it to the local certificate services. 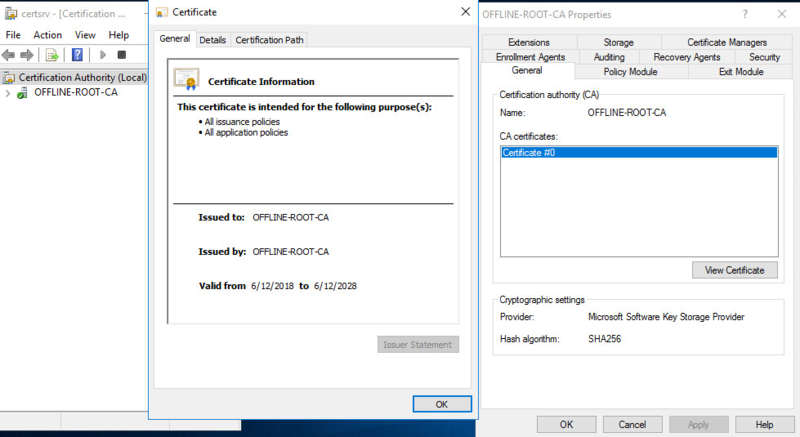 Now that certificate services has been installed and the base configuration is complete, a set of specific configuration changes is required to ensure that an offline Root CA will work for us. 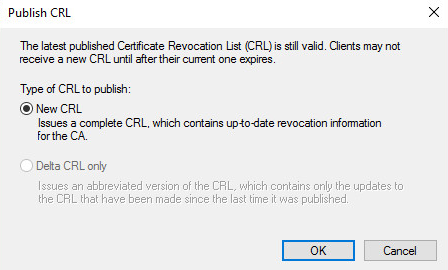 Before we take any further steps, including deploying a subordinate CA for issuing certificates, we need to configure the Certificate Revocation List (CRL) Distribution Point. 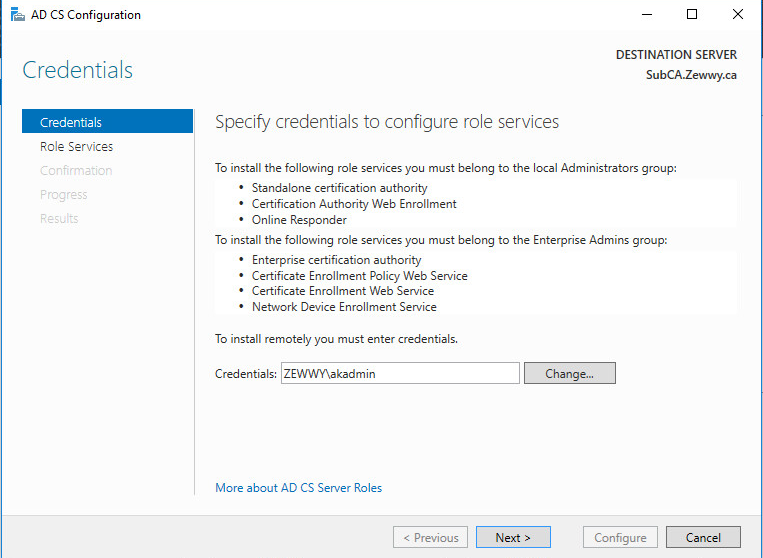 Because this CA will be offline and not a member of Active Directory, the default locations won’t work. For more granular information on configuring the CDP and AIA, see these sources:one and two. In the properties of the CA, select the Extensions tab to view the CRL Distribution Points (CDP). By default, the ldap:// and file:// locations will be the default distribution points. These, of course, won’t work for the reasons I’ve just stated, and because these locations are embedded in the properties of certificates issued by this CA, we should change them. To set up a CRL distribution point that will work with a location that’s online (so that clients can contact the CRL), we’ll add a new distribution point rather than modify an existing DP and use HTTP. 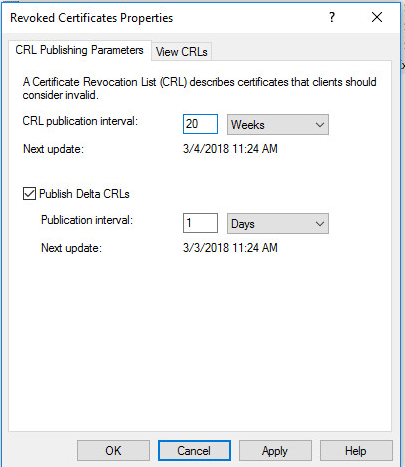 Ensure that ‘Publish CRLs to this location’ and ‘Publish Delta CRLs to this location’ are selected on the default C:\Windows\System32\CertSrv\CertEnroll location. This should be the default setting. *Note* This was a mistake I had to fix manually. and then adding the custom http CDP location that will be the Sub-CA with IIS. *NOTE* UNCHECK ALL CHECKBOXES from the LDAP and FILE, the above picture for those settings are wrong. Apply the changes, and you will be prompted to restart Active Directory Certificate Services. If you don’t remember to manually restart the service later. Before publishing the CRL, set the Publication Interval to something other than the default 1 week. Whatever you set the interval to, this will be the maximum amount of time that you’ll need to have the CA online, publish the CRL and copy it to you CRL publishing point. 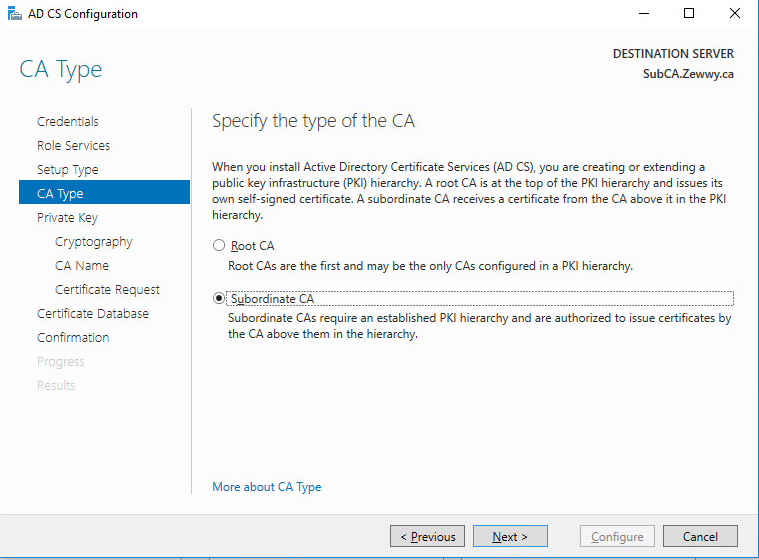 Open the properties of the Revoked Certificates node and set the CRL publication interval to something suitable for the environment you have installed the CA into. Remember that you’ll need to boot the Root CA and publish a new CRL before the end of this interval. 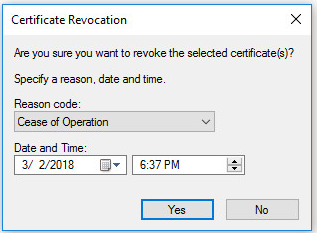 Ensure that the Certificate Revocation list is published to the to the file system – right-click Revoked Certificates, select All Tasks / Publish. We will then copy these to the subordinate CA. 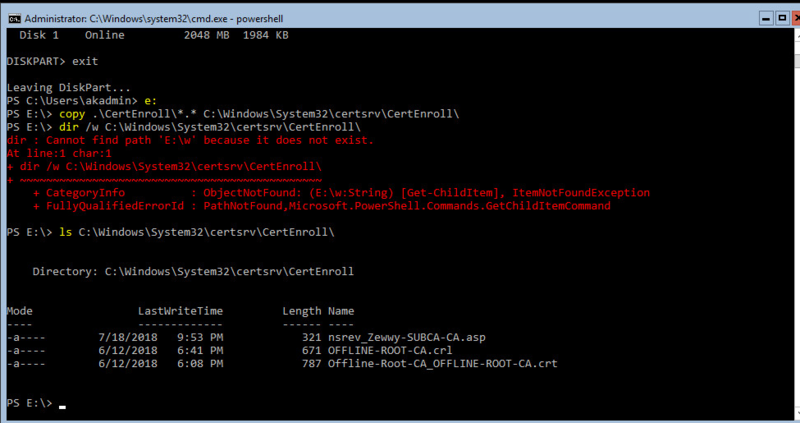 Browse to C:\Windows\System32\CertSrv\CertEnroll to view the CRL and the root CA certificate. The default validity period for certificates issued by this CA will be 1 year. Because this is a stand-alone certification authority, we don’t have templates available to use that we can use to define the validity period for issued certificates. So we need to set this in the registry. As we’ll only be issuing subordinate CA certificates from this root CA, 1 year isn’t very long. If the subordinate CA certificate is only valid for 1 year, any certificates that it issues can only be valid for less than 1 year from the date of issue – not long indeed. Therefore, we should set the validity period on the root CA before we issue any certificates. Here I can see two values that define how long issued certificates are valid for – ValidityPeriod (defaults to 1) and ValidityPeriodUnits (defaults to “Years”). Open ValidityPeriodUnits and change this to the desired value. My recommendation would be to make this 1/2 the lifetime of Root CA’s certificate validity period, so if you’ve configured the Root CA for 10 years, set this to 5 years. You’ll need to restart the Certificate Authority service for this to take effect. Yes this is pretty much a copy n paste of the source, it was so well written and nice to follow, there are just a couple additions I added in where things got a little confusing I hope those might help someone who comes across this. Much like the source in my next post I’ll also cover setting up a Subordinate Root CA, however I will also cover removing an existing CA from an AD environment before replacing it with the new subordinate. As well as cover some errors and issues I faced along the way and how I managed to correct them. This was part was pretty straight cut so I didn’t have much reason to alter it from the source. PS – If you plan on publishing new CRL to be hosted by AD for domain systems, don’t forget to set the DSConfigDN setting on this offline CA. View my TechNet post for Details. I plan on releasing a 3 part series blog post on configuring a new CA infrastructure, in an existing one where an Enterprise root CA has already been configured. In my series I decided to utilize core servers, these provide an additional layer of issues as managing them is a little more difficult as it usual requires more cmd based knowledge or better yet PowerShell whenever there are such options available. Turns outs in this case even more so then ever. I won’t go over too much details here, as I’ll save that for my series. 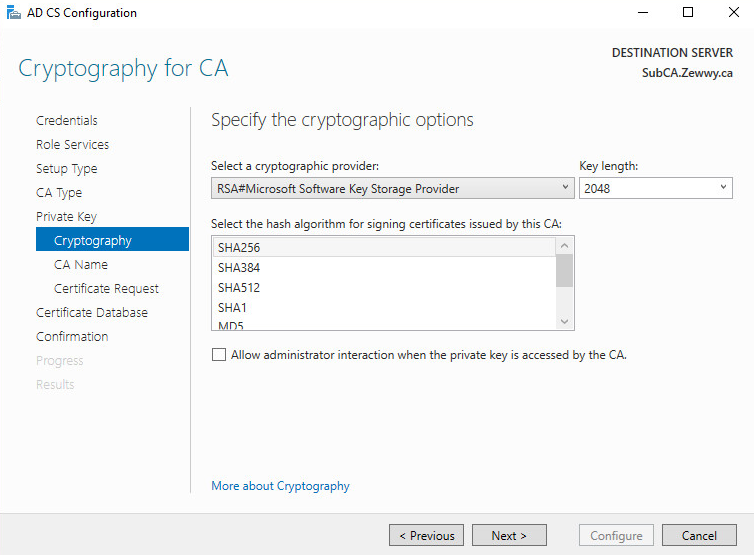 Basically one step requires me to import the signed certificate into the Sub Enterprise CA, being core I have to use the RSAT MMC CA snap-in (funny enough even if you have desktop experience it’s the same tool and snap-in used). What I discovered is when I’d use the RSAT tool on and remote client system loading my actual CA server when loading the nap-in, it would never actually load the input wizard. Then nothing… So I asked about it on Technet. Lucky for me Mark Cooper the Master PKI guy came to my rescue.